On a pallet place purple on bottom and blue on top and mix together where they meet. This should be finger paint that is edible. The area of paint on pallet (which can just be cardboard) should be slightly larger than your child’s foot. Place your child’s foot into the paint and press firmly onto canvas. Make the top of the antennae with the big toes. Let dry. When dry with black paint and thin brush or with large sharpie markers and make body, face and antennae. You can make a few of these at one time that make excellent gifts for Mother’s Day and Father’s Day as well as Grandparents. 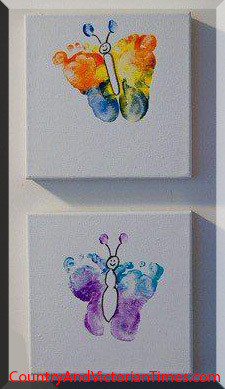 Change out colors to make an interesting butterflies. This entry was posted in Crafts ~ DIY ~ Projects, ~Baby, ~Father's Day, ~Gifts, ~Mother's Day and tagged Butterfly, father, father's, feet, foot, grandfather, grandmother, grandparents, mother, mother's. Bookmark the permalink.